So LOTOJA was a week ago today. I have been way busy this week and sick for half the week also. That is why i am just barely getting around to writing about it. It was pretty awesome though!!! 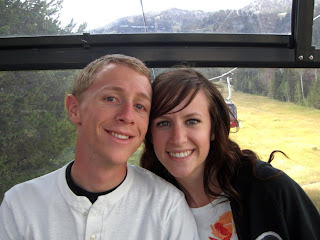 We (Chad, Jeannine, Kevin, and me) had to get everything ready to go on the Thursday before we went to Logan. 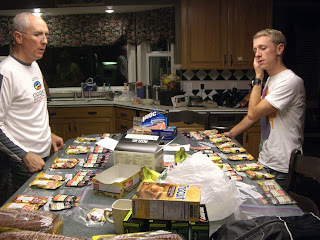 It took so much organizing to figure out what food to put in what bags for which feed zones and how much of what food to brings and figuring out the water bottle system to distinguish Chad and Kevin's water bottles and also water bottles from Gatorade bottles... It was intense, but we finally got it all ready and packed. On Friday we left to go up to Logan about 4:30. Traffic to get on the freeway was horrible! But we finally got on and up to Logan. 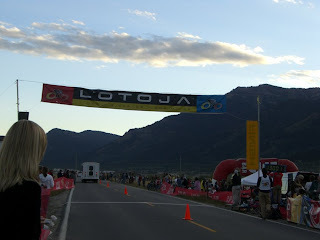 Once we were up there we had to go pick up the race packets with there numbers and jerseys and LOTOJA stuff. That line was sooo long and took about an hour to get through. So finally at about 9 we went and got dinner at this cute little Italian restaurant. I was especially excited because they served Gnocchi, which i have been in love with ever since i had it in Italy. 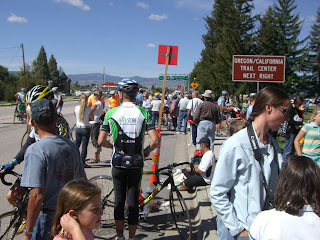 Then we drove out to Treemonton, about a half hour away, to our hotel because everything closer had already booked up way in advance (LOTOJA has 1000 riders, plus all the people in the support crews!) The next morning we woke up bright and early, around 4:30, and got everything loaded. We dropped Chad and Kevin off by the starting line and their start time was 7:34. 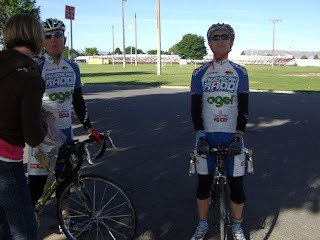 After that we went and got hot chocolates because it was cold up in Logan, and then made our way over to the first feed zone in Preston, ID. Parking by the feed zones was crazy because there were so many people, so we ended up doing quite a bit of walking before the day was finished. It was so much fun to see them at the feed zones. 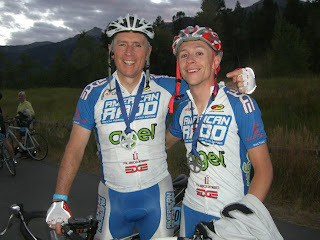 FINISH, 206 miles- Jackson Hole, Teton Village, WY. They did so incredible! At the feed zones toward the end I was almost expecting them to be dragging themselves and wanting to stop, but it was the opposite! Kevin seemed to get more pumped up the closer he got to finishing. I was so happy they did so well. Between the last feed zone and the finish, they definitely slowed down a lot, which is completely understandable, they had gone about 160 miles already and still had 47 to go... At the finish line, it was crazy. There were a ton of people waiting to see their cyclists finish. There was a ton of excitement in the air though. Kevin and Chad finished in about 10 hours 50 minutes of actual ride time. I was so impressed! Kevin placed 24th and Chad, 25th, in their division! I was totally annoyed and sad when Kevin finished though because I didn't actually get to see him cross the finish line! 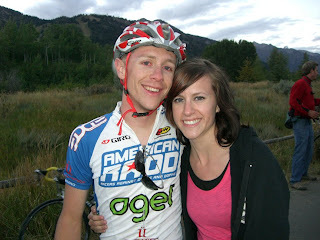 There was a shuttle that went from the parking lot at Teton Village to the finish line. It would go past us every couple minutes or so and block our view of the road. As we were standing there waiting for them, I started getting worried that Kevin would finish right as the shuttle drove by us. Sure enough, that's exactly what happened... 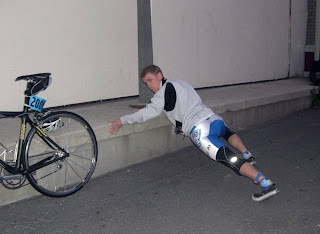 I felt so bad that after all the training and everything he had put into this, i didn't even get to see him finish! I almost started crying! Stupid shuttle... Oh well, I guess there's always next year! Between feed zone 4 and 5, there was a King of the Mountain competition to see who can make it up the mountain in the fastest time. Kevin did so well on that! Out of 1000 riders he got 103rd and climbing it in 19 minutes 20 seconds! WOW! He is so good at climbing hills! 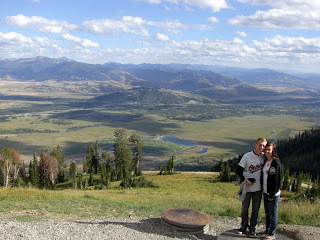 After the race, we checked into our Hotel, The Inn at Jackson Hole, in Teton Village. We had dinner and then went right to bed, we were all exhausted. They has an awards ceremony the next morning. It was pretty boring. We had breakfast at Village Inn and drove up to Jenny Lake, rode on the tram up the mountain in Teton Village, and just hung out. It was nice and relaxing, i loved it! We ate dinner at an Italian place and then got ice cream at Haagen Dazs. That night we sneaked into another Hotel's hot tub because ours was broken. It was fun! The next morning we went out to breakfast at Village Inn again, and drove home. It was a fun trip and sooo beautiful up there! I'm kind of glad that LOTOJA is over because now Kevin isn't going to be gone training all the time. At the same time, I'm a little sad because it was such a huge thing to look forward to and now it's over. 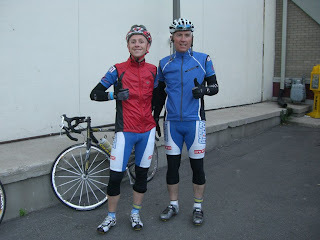 But in another 6 months or so, the training will start up all over again for next year! The Thursday before we left, getting all the food ready. Look at all that! 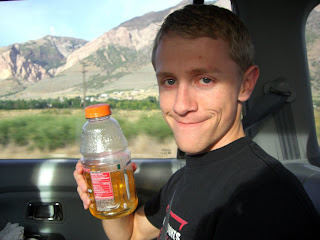 rd 11">On the drive up to Logan, Kevin REALLY had to go... ewwww! 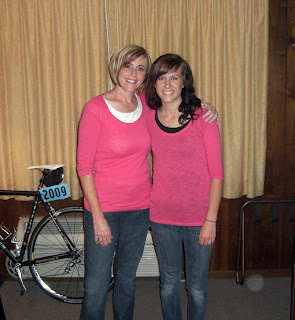 We wore matching pink shirts so the guys could find us easily at the feed zones. Some lady along the way even nicknamed us "The Magenta Girls"
All ready to go and lookin good! Feeling fine at feed zone 1, 34 miles. The feed zones were crowded, busy, and a little crazy. This is feed zone 3 in Montpelier, 80 miles. 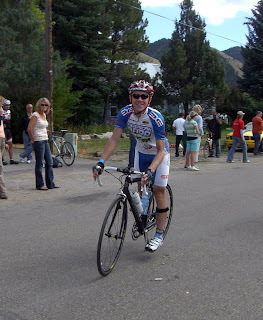 Kevin is all smiles in Afton, WY at feed zone 5, 125 miles. The finish line, 206 MILES! 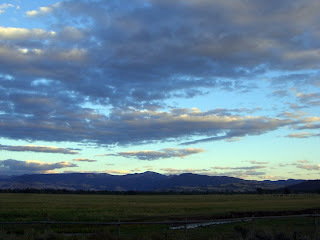 The sky and the mountains were so beautiful! 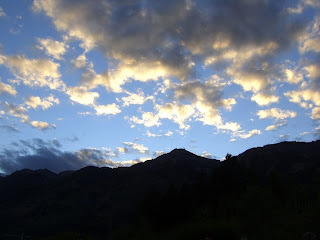 Another picture of the sky while we were waiting at the finish line. My Kevers after he finished! WOOHOO! 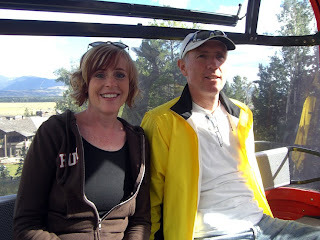 Jeannine and Chad riding the tram up the mountain. At the top of the mountain. What a view!! >This sign was hanging outside the Italian resturant in Jackson. 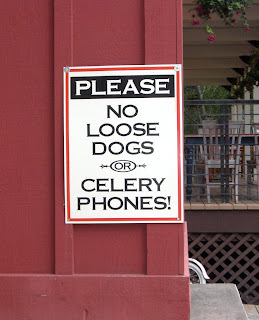 I'm not sure what a celery phone is... haha! WOW! I am so proud of them. That is so incredible! Nice job documenting it! I loved all the pictures!